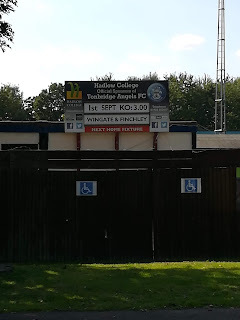 Initially, I had expected my first groundhopping game of September to take me to an FA Vase match. A few weeks ago, I had started to scan the draw, searching for a tasty tie or two to possibly attend, only to be swiftly informed by the missus that if I was to have use of the car that afternoon then I would need to ferry her to and from Tunbridge Wells. It turns she had been invited for afternoon tea to celebrate a baby shower for one of her friends. Two things here. Firstly, when did baby showers become a ‘thing’ here in England? Surely this is just another example of the type of Americanisation that is blighting the shores of blighty. Secondly, when did it become acceptable for a group of thirty-something females to take afternoon tea? Pretty sure the last time I checked (I’ve never actually checked, in fairness) afternoon tea was the preserve of middle-aged, middle-class women with names like Doris and Irene. Turns out I couldn’t be more wrong. Apparently, afternoon tea is quite the fashionable trend these days. Who knew? 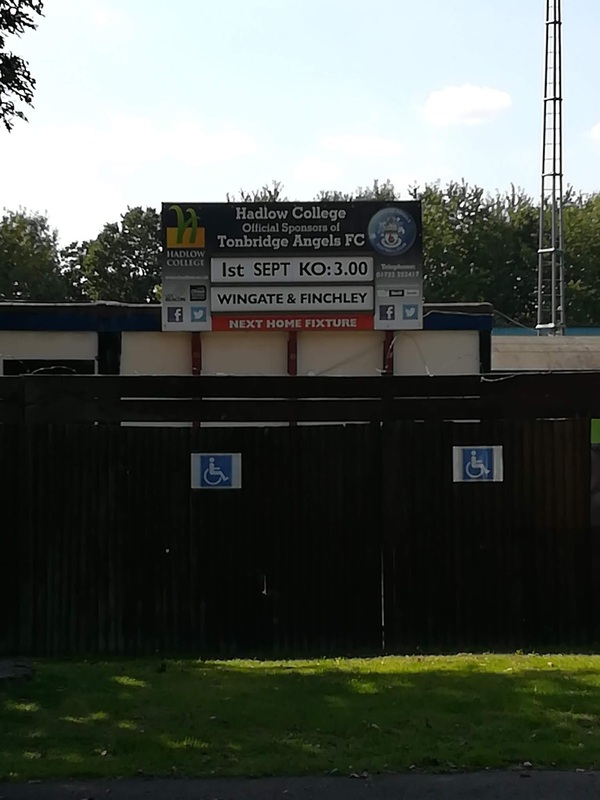 Anyway, quickly checking and discovering that Tunbridge Wells had been drawn away in the Vase, I instead turned my attentions slightly north and found that Tonbridge Angels were at home in Bostik Premier League action against Wingate and Finchley. So I decided to head there instead. My FA Vase debut will have to wait for the time being. 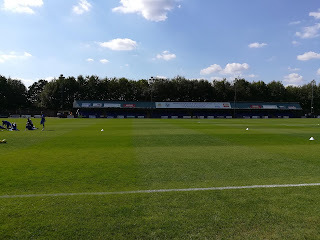 Having dropped the wife off, reminding her to keep her little finger firmly outstretched as she supps, I set the SatNav to Tonbridge’s Longmead Stadium. Despite a rather fraught drive, the duration of which was spent with me explaining countless times to the kids that baby showers consist of neither babies or anybody getting wet, we arrived at the stadium in plenty of time. As has tended to be the case on most of my travels so far this season, parking is not a problem. The car park is huge. The only issue I have with regards to parking comes after the match when I had a momentary blank on where we (I) had left the car. The eldest swore it was one way; the youngest the other. Cue a lengthier than strictly necessary traipse around the car park. But we’ll skip over that. After paying £11 for me to get in (the most expensive individual charge I’ve encountered so far this season) and £3 for one of the children (the first time I’ve been charged for kids – one under 13 gets in free per adult, the other has to pay) I enter the stadium. Just to make it clear, I’m not griping about having to pay for my kids. Far from it. I’ve expected it at other grounds too, but to date they had been waved through. One club was always going to be the first to charge at some point, and it just so happened to be today. The program, at £2.50, is also the most expensive I’ve encountered this season. That said, it is also the best I’ve purchased to date as well; full of information and stats, including an ongoing A-Z series of all the players who have ever played for the club. While the names of the players, who in this particular issue all begin with the letter ‘B’, mean nothing to me, I would imagine fans of the club really enjoy this feature, taking a trip down memory lane at seeing some of the names who have previously pulled on the club’s blue jersey. As befits one of – if not the – best supported teams in the division, the ground itself looks great. Two covered spectator areas behind each goal, a great clubhouse, huts dotted around the sizable grounds selling teas, coffees, sweets and even curries, an area for club directors and press, and a fantastic looking main stand. The playing surface also looks immaculate. It really is very impressive. It is with the impressive-looking main stand, however, that I have one little gripe about my experience at the Longmed Stadium. Just before entering, we are stopped and told it costs an extra £1 to sit. Now this may be standard practise at this level, but it is the first time I have experienced it and it came as something of a surprise. And disappointment. A combination of not having much money and being a bit of a tightwad leads me to decline this offer and instead stand. It’s a decision I later come to regret as a lack of shade on what is a gloriously hot, sunny day leads to my five-year-old being whinier than usual. Never mind. On the subject of the weather, for the first time since the first week of the season, its glorious again. I hear a couple of fans moan about it being a ‘bit too hot’. Not for me, though. Enjoy it while you can, I say. Cold, wet, windy days are not far away. The first-half of the match belongs largely to Tonbridge. The visitors have a chance to take the lead within the first minute, but other than that the game is mostly played at the other end of the pitch. Following a lengthy stoppage following what looked like it might be an ACL injury for Tom Beere (get well soon, hopefully it wasn’t as serious at it looked), the Angels ramp up the pressure. Shane Gore makes two great saves to keep the scores level, but can do nothing to prevent Tonbridge skipper Tom Parkinson giving the hosts the lead. Soon after, Sonny Miles doubles the advantage, bundling in a header at the back post (see video below). At this point it appears to be a question of just how many Tonbridge will score. They are dominant. Wingate and Finchley are all over the place. Then, during the long injury-time at the end of the first half, the visitors get themselves back in the game. The Angels defence fails to clear their lines and Tommy Tejan-Sie lashes in to breathe life back into the game. 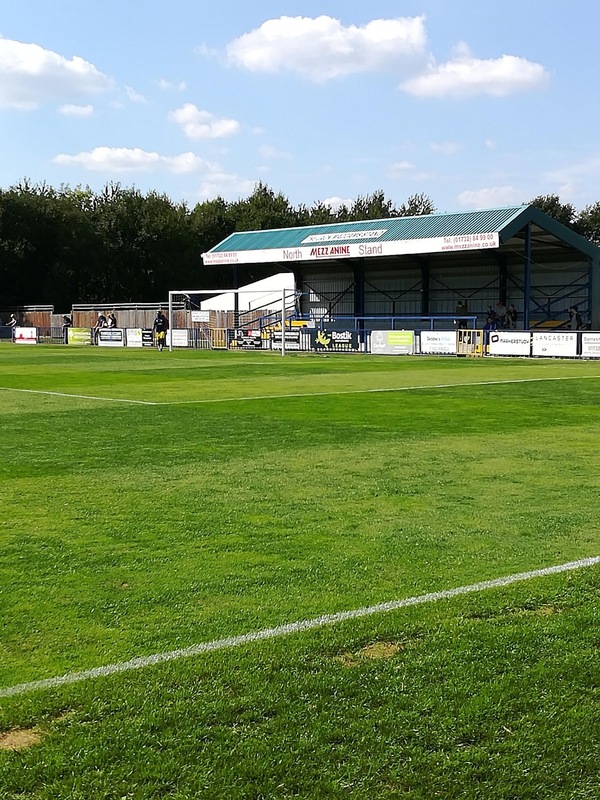 The second half is a far more even affair – Wingate are much improved. That said, Tonbridge should have put the game to bed. Firstly, the hugely impressive Adem Ramadan wriggled through three or four challenges, only to blaze high and wide when clear through on goal. Had he scored, then it would have been an absolute worldie. Then, Tom Whitnell chased his own pass to set himself on a one-on-one with the keeper, only to fire his shot the wrong side of the upright. Poor. 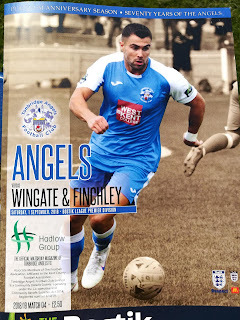 Wingate hung on, though, and with time running out had a golden chance to equalise, only for David Manu to head wide from close range deep into injury time. So my trip to Kent ends with a 2-1 win for the home side, which was deserved over the 90 minutes.